Unfortunately summer has come to an end here in the northern hemisphere. It’s that time again for chilly nights and pumpkin beer. 😉 I have to say although I do like some aspects of autumn I’m just not feeling it this year. Summer seemed all too short. The weather never really got “summery” until late August so I was just starting to get in the mood. This past Saturday was a beautiful day and since it was the last Saturday of summer, my wife and I took the opportunity to just hang out on the deck, relax, and enjoy the day. A nice end to the season. While I was manning the charcoals on the grill, I played around with a new to me Canon EOS M camera that I purchased on eBay. 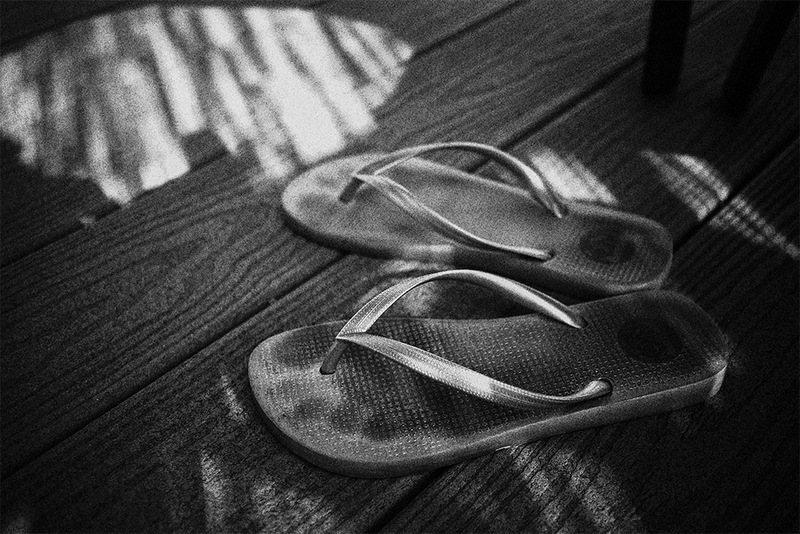 Just trying to get the hang of the cameras operation, I snapped a photo of my wife’s well-worn flip-flops (mostly because there wasn’t anything else handy). I didn’t plan on using the shot for anything beyond my own test shot references but since I didn’t head out for any other photography the past week I thought it would make an apt end of summer image. If there is anything that represents summer, the flip-flop always seems to be at the top of the lists. But seeing this photo makes me realize I need to get back out there and do some serious shooting. I’ve been in a kind of limbo with my creativity and I need to give myself a jolt. But I guess that’s what autumn is for – getting back to business.